Despite pre-ride bolt checks and trailhead tire-kicking, untimely mid-ride mechanicals are simply a reality. Generally speaking, working with multi-tools means working with devices compromised in functionality in order to slide as many widgets into as little space as possible. 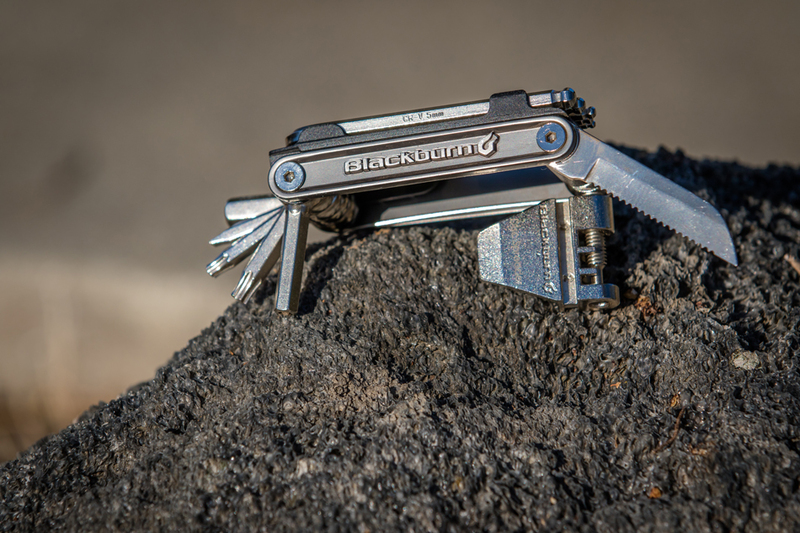 Blackburn's Wayside offers the convenience of 19 different tools, but with the capability of adjusting hardware that’s difficult to reach with most other multi-tools. 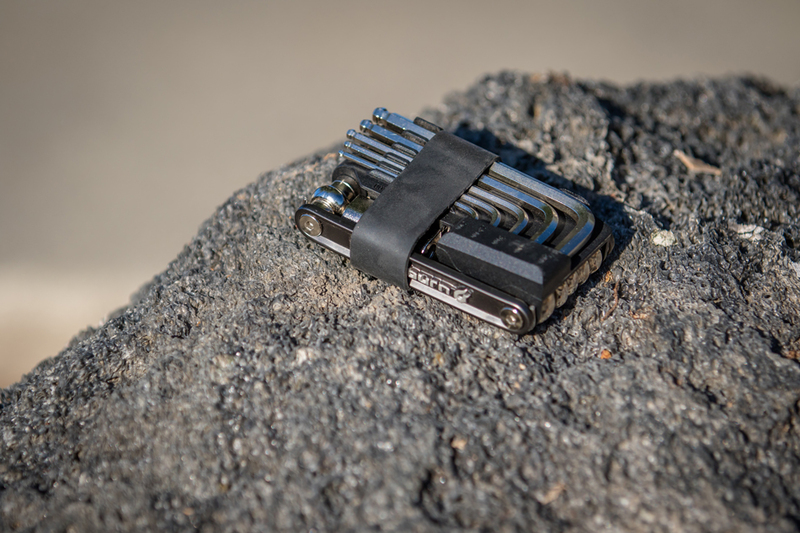 The Wayside features 19 tools, the most unique being a range of individually removable hex keys in commonly used 2-, 2.5-, 3-, 4-, and 5-millimeter sizes. Each hex key snaps onto the tool, and I found the ball ends to be helpful for accessing tricky locations, like 4-mil chainguide-mount bolts positioned behind a chainring, or for maneuvering around shifters to access a brake-lever mount. Many multi-tools have a 2-millimeter hex wrench which can fit into the tiny brake lever reach adjustment screw, after the brake is removed from the handlebar. The L-shaped bend of Wayside's individual 2mm hex fits in between the handlebar and the brake lever body, which is super convenient for riders who don't have a tool-free lever-reach adjustment. Hunter-gatherer types will appreciate the locking, serrated knife blade should some impromptu foraging–or a bit of salami slicing–go down. As chains have become thinner to accommodate more gears on the cassette, I've experienced a direct correlation to an increase in chain-related fits of rage. Thankfully, the Wayside's chain breaker provides a solid and precise interface, and when I needed more leverage I simply extended the tools at the opposite end into the palm of my hand. The chain breaker is compatible with 7- to 11-speed varieties, and also moonlights as a brake pad spreader. The easily overlooked chain assembly hook is handy for riders without the trailside convenience of slackening the chain via clutch derailleur, or who choose not to remove the rear wheel while reconnecting the chain. Cleverly placed inside the chain tool are spoke wrenches for three common sizes and a presta valve core tool. Although 8-mil hex keys are commonplace on multi-tools, many are too stubby to be functional. I measured the Wayside's at about 2.5 centimeters long, which provides just enough clearance to loosen pedals or tighten a frame pivot. At a glance, the 8-millimeter key appears to be fairly standard issue, but a closer look reveals a hollow core where the removable hex keys can be inserted if more leverage is needed for a stubborn bolt. The large rubber band provides additional hex-key security and helps reduce any unwanted tool movement while inside of a pocket. Some riders won't care for individual hex keys being removable. In my opinion, though, combining proven multi-tool features with removable hex keys separates the Wayside from other tools with similarly intended functionality. It's tough to top single-purpose tools when it comes to doing a repair job properly, but the $35 Wayside has proven to be a versatile and reliable choice when there is no other choice.